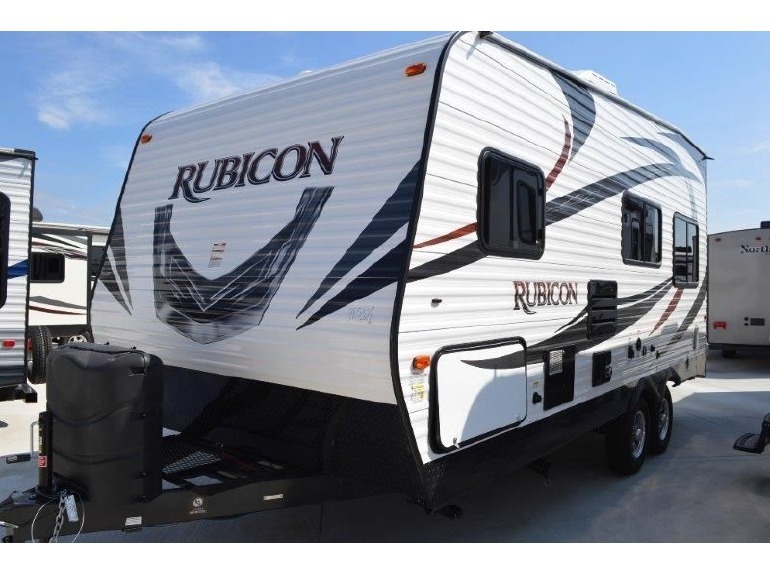 2017 Dutchmen RV Rubicon 1905, Take this Dutchmen Rubicon toy hauler travel trailer on any adventure knowing you will enjoy every minute you spend camped inside! 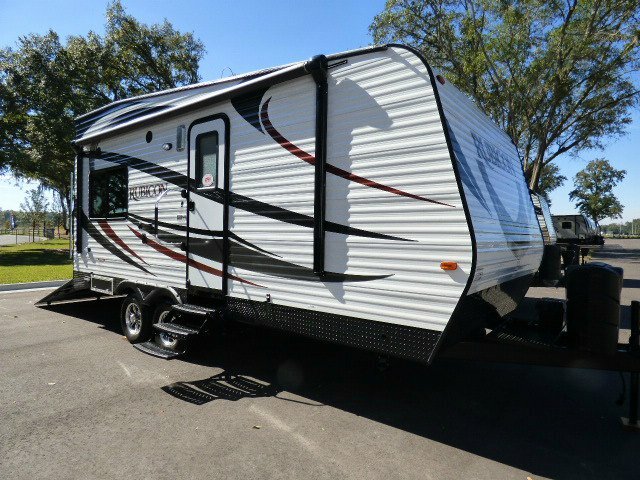 Model 1905 features up to 14' of cargo hauling space for your toys, plus all the amenities you need to enjoy time away from home.Use the rear ramp door with spring assist to easily load and unload your cargo. 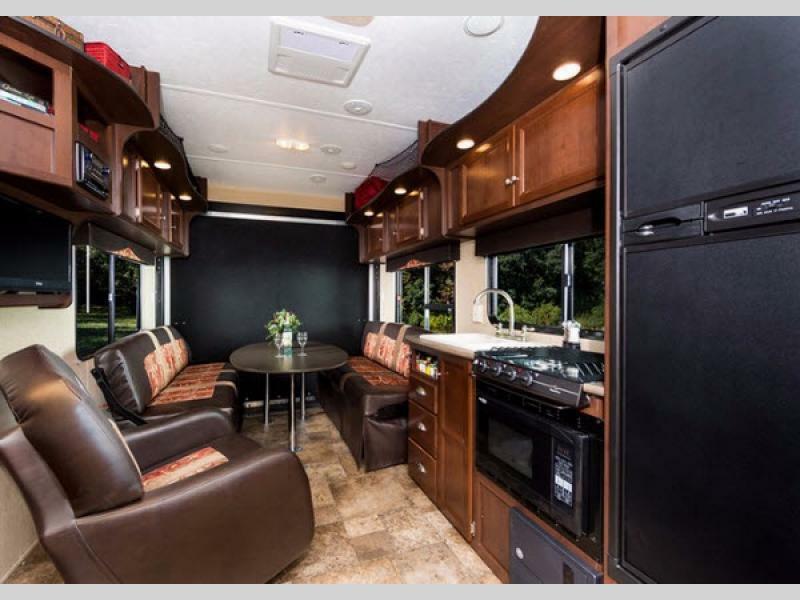 Inside find a fold away dinette table with two sofas which provide plenty of seating for meals and just hanging out once the toys are removed. 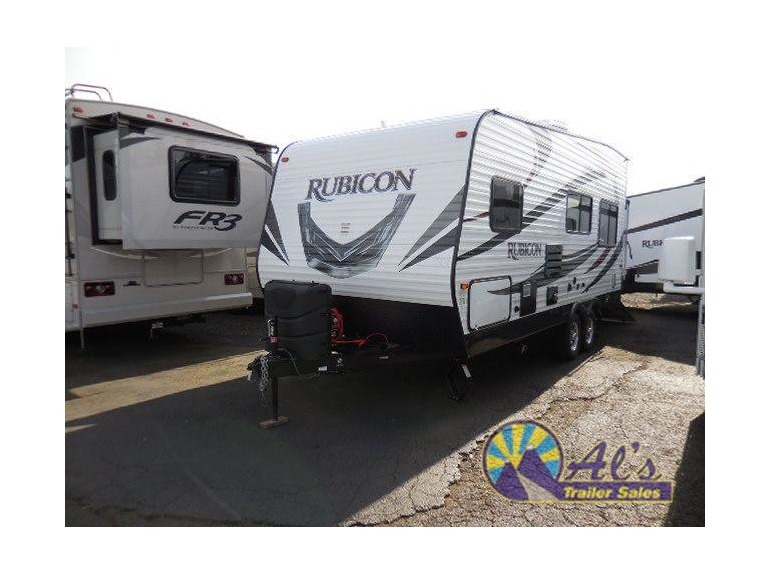 There is also plenty of overhead storage for your gear above both sofas in the cargo space. The flat screen TV mounted next to the sofa and to the left of the door is perfect for viewing from any seating inside. There is also a radio and DVD player to enjoy. 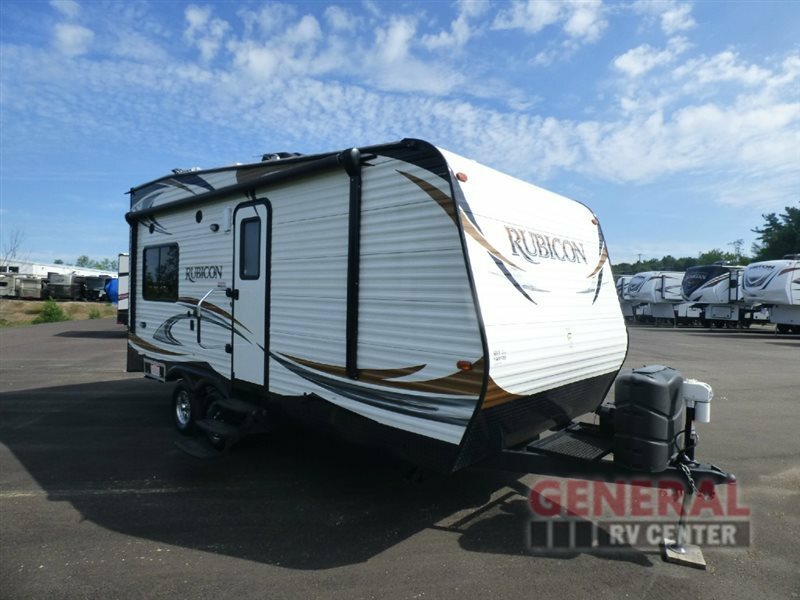 You can add an optional lounge chair if you like for even more seating, the choice is yours.As you enter the main side entrance find a convenient pantry to your immediate right. 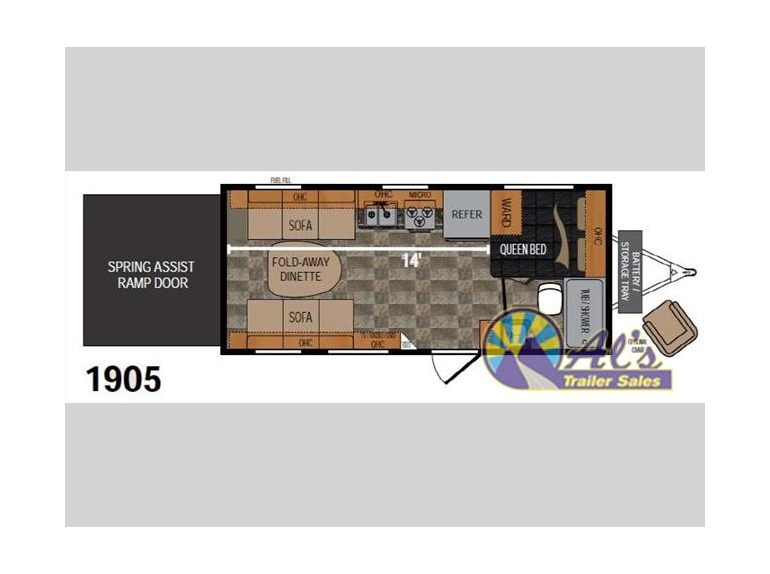 The kitchen is straight ahead and features a refrigerator, three burner range with overhead microwave, and a double sink, making cleaning up a snap. 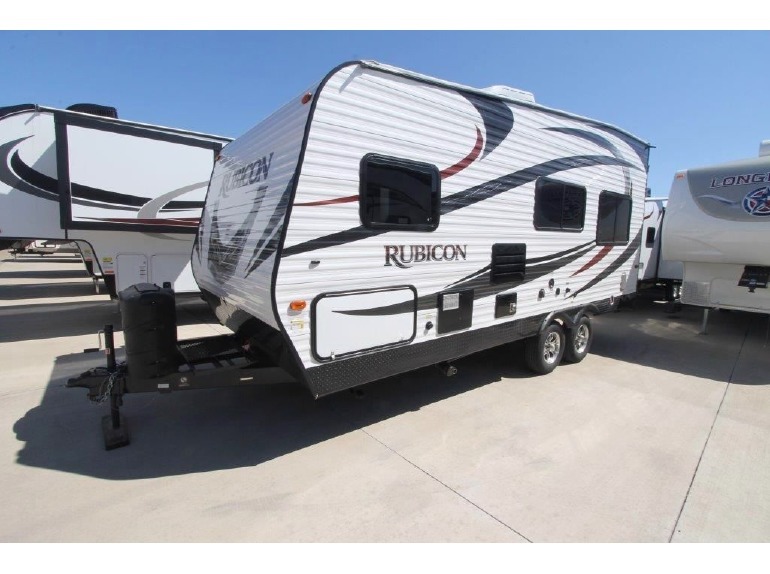 You will also find plenty of overhead storage, and lower cupboards and drawers for your dishes and things.In the front of this Rubicon toy hauler enjoy sleeping on a queen size bed with storage above the head of the bed. There is a wardrobe off the foot of the bed for clothing. 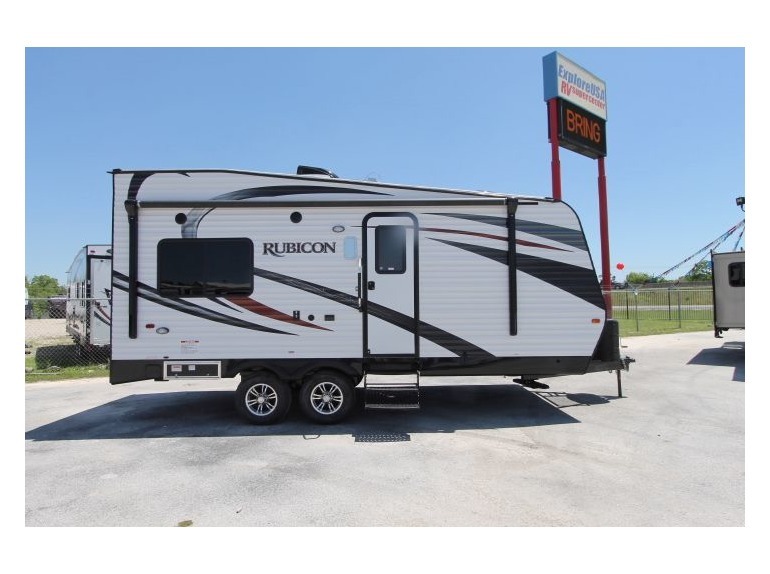 In the opposite corner find a complete bath including a tub/shower, toilet, and vanity with sink, plus more.The fuel fill outside will be handy to keep the fun going all weekend long, and you can also choose an optional Onan generator for times when you want to take your fun off the beaten path away from it all!